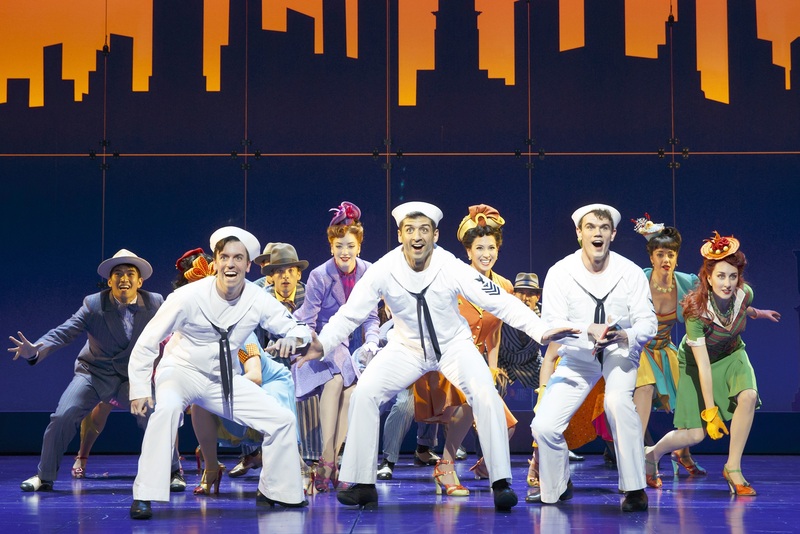 There’s a shiny production of the musical On The Town at Broadway’s Lyric Theatre, and the shiniest star of all is Tony Yazbeck’s brilliant singing/dancing performance as seaman Gabey. He’s followed closely by the superb performances of his buddies-on-24-hour-leave Clyde Alves and Jay Armstrong Johnson, and his would be love, Miss Turnstyles Megan Fairchild. Let me also mention the hilarious performances of Alysha Umphress as Hildy and Elizabeth Stanley as Claire. Oh, and then there is the funny-muggy performance by Jackie Hoffman as virtually everyone else. Throw in a superb singing and dancing ensemble, and you have the makings of a shiny production indeed. Swiftly and hilariously directed by John Rando (think pratfalls and lots of action close to the stage apron) and utilizing state-of-the-art projection by Beowulf Boritt (whose name alone comes in for the win), the show barrels along in 2 hours 40 minutes. Joshua Bergasse’s extraordinary choreography is sure to be recognized come award time, and that he is blessed with the talent of Yazbeck and Fairchild for his Broadway/Ballet mix of movement makes it all the better — the choreography here is the best I’ve seen on Broadway nice Newsies. But the real takeaway here is Tony Yazbeck…his vocals simply soar in “Lonely Town” and when does he breathe during “Lucky to be me”? ?…but then come the dance numbers and I can’t think of a musical where actor and his talents are better on display than Tony’s in On The Town. It is breathtaking, and his Pas de Deux with ballerina Fairchild is simply sublime — but the audience has long been won over before that point. Whether you are rooting for Chip and Hildy, Ozzie and Claire, or Gabey and Ivy, make room for this sublime romp through 40’s New York City.